2019 Event Tickets for Grand Rapids Concerts are on sale now! At any given time, Grand Rapids is home to over 100 music venues. These venues encompass arenas, clubs, fields, cafes, and other spaces. The “Grand Rapids Music Trail: The Ultimate Guide to Local Live-Music Venues” celebrates the evolving talent and ingenuity of local musicians by highlighting venues that support hometown musicians. A true grassroots effort, the guide is organized by neighborhood, summer/seasonal, ticketed, and performing arts. This ensures that listeners can explore the parts of the trail that appeal to their taste. For Concerts in Grand Rapids, please see our event listing calendar of Concert tour dates in 2019! Many cities have bars with live concerts. 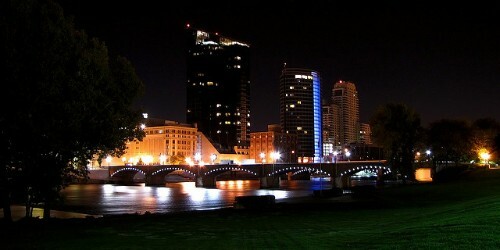 However, Grand Rapids is special because it has specialty craft beer in its concert venues. Brewers and enthusiasts hunt down the best takes of the drink while supporting local musicians. In Grand Rapids, a number of venues do this well, including B.O.B.’s House of Music & Entertainment (part of B.O.B.’s Brewery), Mulligan’s Pub, Billy’s Lounge, Founders Brewing Co., Mojo’s Dueling Piano Bar & Restaurant, The Score, The Back Forty Saloon, and Pyramid Scheme. Most of these venues bring in local bands on the weekends. Some even host concerts on weekday, hoping to attract more customers with the promise of music and dance. Many of these spots are small, holding a maximum of around 100 people, which guarantees and intimate, unforgettable show. Genres vary by brewery; they range from country to rock to punk to metal to hip-hop to blues to indie. Listeners who want a unique drink will devour these local-loving hot spots in Grand Rapids. Western Michigan’s music scene is often described as “up-and-down” by local and regional publications. Although there is a consistent degree of camaraderie in the scene, the regional music industry is notorious for booking issues, temperamental managers, finicky crowds, and abysmal pay. Industry veterans praise much of what Grand Rapids has to offer, such as supportive musicians and sheer talent. On the other hand, there is a lack of resources in terms of rehearsal spaces, performance spaces, and teaching connections. And, like every music scene, there is a limited amount of space for those at the top in Grad Rapids. Hard work, talent, devotion, and creativity are often unrewarded. These faults aside, Grand Rapids’ music scene is actually on the rise. As a response to these longstanding complaints, the community has developed more venues, more shows, more trendy spots, more locally-based radio stations, and more genre diversity. How Do I Find Upcoming Grand Rapids, Michigan Concert Events Near Me? See below for a list of Concerts in Grand Rapids MI scheduled for 2019.